The school of life can hand us some pretty tough lessons. 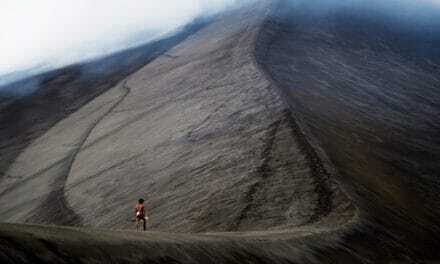 If we fail in our efforts, we may come away from the experience dejected. Those feelings can be particularly difficult to bear if we’re aware that our failings stem from wrongdoings we might have (or should have) avoided, incidents that leave us wearing a badge of shame. 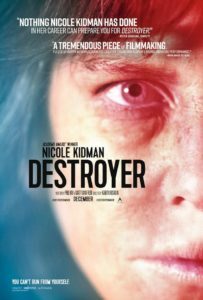 And rectifying those missteps may prove quite the challenge as a downtrodden law enforcement professional discovers for herself in the gripping new crime thriller, “Destroyer” (web site, trailer). Los Angeles Police Detective Erin Bell (Nicole Kidman) looks like she’s been on the losing end of one too many altercations. The hard-drinking, overworked, sleep-deprived investigator comes across as being one step away from becoming a walking corpse. Yet, somehow, she manages to keep going, often following her own rules and keeping others, like her professional partner (Shamier Anderson), out of the loop. Her renegade work habits have earned her a reputation among her peers. But, then, that’s due in part to what she did in the past and not just her current routine. Sixteen years ago, when Bell was new to the job, for her first assignment, she was tasked to work an undercover operation with an experienced FBI agent, Chris (Sebastian Stan). They were charged with infiltrating a gang that roamed the nearby California desert engaging in assorted criminal activities, most notably bank holdups. The duo went in with the best of intentions but soon found themselves in over their heads, both in terms of the temptations all around them and the undeniable attraction that developed between them. A recipe for trouble was clearly in the offing – and on multiple fronts. 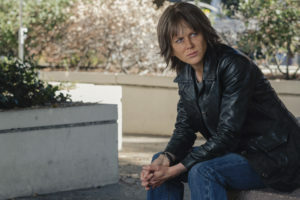 Los Angeles Police Detective Erin Bell (Nicole Kidman) seeks to make amends for mistakes made on a case 16 years ago in director Karyn Kusama’s latest release, “Destroyer.” Photo by Sabrina Lantos, courtesy of Annapurna Pictures. But, if that weren’t bad enough, ghosts from that first fateful assignment have now come back into Bell’s life, dredging up painful memories and lingering regrets. One by one, she runs into former gang members (James Jordan, Zach Villa, Tatiana Maslany), some of whom have gone straight with others continuing their lawless ways. However, rather than allowing herself to be undone by these circumstances, Bell decides to take matters into her own hands, using these old contacts to help her make amends for her past. They put her in touch with a crooked attorney (Bradley Whitford) who can lead her to what she seeks most – the gang’s evil kingpin, Silas (Toby Kebbell). It’s a quest that Erin hopes will enable her to redeem herself for the events of so many years ago. Thus begins the detective’s hard-fought odyssey to set matters to right. Through a series of flashbacks and the film’s main narrative, viewers discover how Bell arrived where she’s at, as well as why it’s so important for her to rectify past missteps. It’s a gritty path, to be sure, but it also holds the potential to be transformative and redemptive, considerations that Erin would like to see realized while she still has a chance. When we stumble in life, we may think there’s no way to make up for it, that we’re fated to suffer unforgiveable consequences. That can be especially true when we know we screwed up – and knew we were doing so at the time – leading us to believe that there may be no escape from our self-imposed loathing. But such is not the case. We always have an opportunity to right our wrongs to redeem ourselves. “Destroyer” shows us what it means to make the effort at doing just that. It may not be an easy process, as Erin finds out firsthand here. However, with the right intentions and a little determination, we’re likely to achieve what we set out to do, and there’s a lot to be said for that. Although a bit sluggishly paced at times, this crime saga about the search for justice and redemption is a surprisingly good thriller with an excellent Golden Globe-nominated lead performance by Kidman in a decidedly different role. The clever storytelling format, coupled with a no-holds-barred approach to the action sequences, combine for an intriguing (and at times shocking) saga, made all the better by inventive editing, an eclectic but well-orchestrated mix of cinematography styles and a carefully measured sequence of revelation. 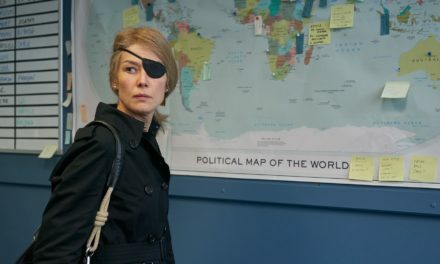 Director Karyn Kusama’s latest has been getting an undeserved bad rap in some critical circles, but, thankfully, an increasing number of reviewers have been coming around on this one. Go see it for yourself and make up your own mind; you may well come away pleasantly surprised. What we make of our second chances depends on how we approach them, particularly when it comes to recognizing the opportunities they represent. If we’re paying attention at all, we should realize that such breaks may not come our way all that often and that it would be in our best interests to jump on them when they appear. They just may make it possible for us to take off that badge of shame, something that should be especially important to someone who wears a badge for a living. Here’s wishing her (and us) luck. Even when we get all the breaks, sometimes life just doesn’t satisfy us. We pursue the opportunities that present themselves, but somehow they inevitably fail to live up to their billing, leaving us feeling unfulfilled. And, if this pattern continues unabated, at some point, we may grow despondent, perhaps engaging in various forms of unproductive or even self-destructive behavior. 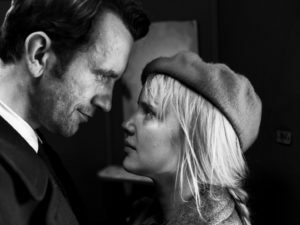 So it is for an entertainer who has a chance to have it made and ends up sabotaging herself at every turn, a saga chronicled in the melancholic new Polish drama, “Cold War” (“Zimna wojna”) (web site, trailer). In 1949 Poland, not long after the fall of the Iron Curtain over the Soviet satellite states of Eastern Europe, the government commissions a pair of entertainment professionals, musician Wiktor Warski (Tomasz Kot) and choreographer Irena Bielecka (Agata Kulesza), to scour the country in search of candidates for a troupe of singers, dancers and musicians to give high-profile public performances at home and in foreign lands celebrating traditional Polish folk art. While Wiktor and Irena have some freedom to choose who they want, their work is closely scrutinized by their government sponsor, Lech Kaczmarek (Borys Szyc), who’s concerned that the candidates selected are suitable artistically, politically and ethically, model citizens of a contemporary Communist Polish society. One aspiring singer, Zula Lichon (Joanna Kulig), captures everyone’s attention. During her audition, the beautiful young vocalist reveals her angelic singing voice. But she also appears to possess a wealth of other qualities that intrigue Wiktor, both personally and professionally. As musical director of the troupe, he takes a special interest in her, seeking to mold her into a featured performer. There’s just one problem: She carries some heavy baggage, having been charged with stabbing her father and being placed on probation. It’s not the kind of reputation that sets well with Kaczmarek, who fears that, if her secret were revealed, it might disgrace the troupe and its prospects for the future. 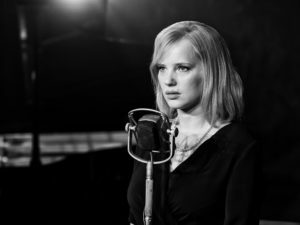 Polish émigré Zula Lichon (Joanna Kulig) delivers cool but steamy renditions of numbers from her homeland in Parisian nightclubs in director Pawel Pawlikowski’s award-winning new offering, “Cold War” (“Zimna wojna”). Photo by Lukasz Bak, courtesy of Amazon Studios. Wiktor, however, believes that he can manage Zula and keep her skeletons in the closet. He convinces Kaczmarek to let her become a member of the troupe, and, over time, the more Wiktor works with Zula, the closer they become personally, eventually striking up a torrid but somewhat clandestine romance. As the troupe begins touring, Zula is a stand-out sensation, contributing significantly to its popularity and artistic accomplishments. At the same time, Kaczmarek, who also quietly longs for Zula, strikes a deal with her to spy on Wiktor, a condition of her probation aimed at ensuring her loyalty (and, hence, her continued participation in the troupe). Kaczmarek’s interest in keeping tabs on Wiktor stem from suspicions about the director’s commitment to the government’s objectives for the troupe. For instance, Kaczmarek takes note of Wiktor’s less-than-enthusiastic response to a government “suggestion” that the troupe begin performing pieces other than just traditional Polish folk songs, namely, propaganda-based compositions dealing with subjects like land reform and wealth redistribution. Also, given that Wiktor’s looked upon as being somewhat more free-thinking because of his artistic sensibilities, Kaczmarek can’t help but wonder whether the musical director can truly be trusted. Singer Zula Lichon (Joanna Kulig, right) and musical director Wiktor Warski (Tomasz Kot, left) engage in a torrid romance across Europe in the Oscar-nominated feature from Poland, “Cold War” (“Zimna wojna”). Photo by Lukasz Bak, courtesy of Amazon Studios. As it turns out, Kaczmarek has good reason to have his doubts. During a concert date in East Berlin, Wiktor hashes out a plan to defect to the West, and he asks Zula to join him. He successfully carries out his plan, making his way to Paris. But Zula stays behind, continuing her performances with the troupe. Thus begins an on-again/off-again romance across a divided continent in which each spends some time in the West and some time in the East, ever searching for the elusive happiness they seem to crave but are never able to find. Along the way they have involvements with other partners – Wiktor with a French poet (Jeanne Balibar), Zula with a French filmmaker (Cédric Kahn) and even with Kaczmarek – but they always seem to come back to one another, only to part ways again, that is, until they come up with a unique solution to their unhappiness. 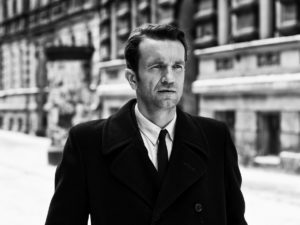 “Cold War” is, at times, a frustrating film to watch. One can’t help but hope that Wiktor and Zula will find what they’re looking for, but the picture shows what it means to search for what one wants and never finding it. The protagonists try to claw their way through a maze of self-destructive behavior, some of it understandable, some of it completely inexplicable. It might be easy to chalk things up to the oppressive conditions under which they live in Communist Era Poland, but, when they’re in the freedom that Paris affords, they seem just as unsatisfied as they were in Warsaw. In many ways, this is a sort of personal hell from which escape seems impossible. There must be a way out, though finding it may be more of a challenge than either of them realizes. The efforts of Wiktor Warski (Tomasz Kot, left), musical director of a Polish performing troupe, are scrutinized by government official Lech Kaczmarek (Borys Szyc, right) to ensure that he adheres to expected official dictates in the new award-winning drama, “Cold War” (“Zimna wojna”). Photo by Lukasz Bak, courtesy of Amazon Studios. This gorgeously filmed, sublimely cool story of troubled romance pays fitting homage to European art films of the 1950s and ʼ60s with a narrative somewhat reminiscent of the French drama “Betty Blue” (1986). Beautifully shot in black and white, director Pawel Pawlikowski’s bittersweet tale features an outstanding performance by Kulig, both in her musical numbers and her diverse dramatic scenes. However, after a strong beginning, the picture begins to meander somewhat toward the middle, as if the director didn’t quite know how to bridge the opening to a conclusion that he already had in mind. It feels like all the makings of a great film are here but that they don’t quite gel as well as they might have in the finished product. See it for the gorgeous cinematography and Kulig’s outstanding performance, but don’t be surprised if you come away from it feeling somewhat like the unsatisfied protagonist. Despite these shortcomings, the film has been lavished with praise in recent award competitions. 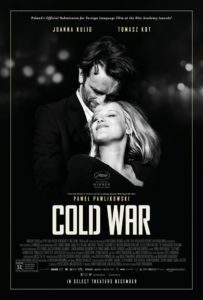 At the 2018 Cannes Film Festival, “Cold War” won the award for best director and earned a Palme d’Or nomination, the event’s highest honor. Subsequent to that, the picture was named best foreign language film by the National Board of Review. And, in upcoming contests, this offering has captured three Oscar nominations (best foreign film, director and cinematography) and four BAFTA Award nods (best foreign film, director, original screenplay and cinematography). Previously the picture also received a Critics Choice Award nomination for best foreign language film. 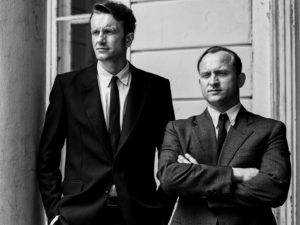 Seeking artistic freedom during the early 1950s, Wiktor Warski (Tomasz Kot), musical director of a Polish performing troupe, seeks to make his escape to the West while on a concert date in East Berlin in “Cold War” (“Zimna wojna”). Photo by Lukasz Bak, courtesy of Amazon Studios. It’s regrettable, perhaps even tragic, when we’re unable to see the good fortune that blesses us. But, for what it’s worth, sometimes that’s not enough to give us what we believe we need to make us feel happy and fulfilled, be it in our love lives, our vocational callings and our very appreciation of life. Stories like those depicted in “Cold War” may sadden us, but one would hope that they leave us grateful for what we have – and make it possible to wish the same to others. Join host Frankie Picasso and me for the next edition of Movies with Meaning on The Good Media Network’s Frankiesense & More broadcast on Thursday, January 31, at 1 pm ET. In this special edition, we’ll talk about the Top 10 Movies of 2018. For the video version, tune in on Facebook Live by clicking here. And, for the audio only podcast edition, check out The Good Media Network’s home page by clicking here. Join us for a fun look back at the year’s best! Copyright © 2019, by Brent Marchant. All rights reserved.